By Rick Miller, PhD, CFP®, Founder of Sensible Financial, and Scott Haglund, FSA, MAAA FLMI, Vice President & Director of Actuarial Services at Life & Health Federated Life Insurance Company. This presentation was delivered in live webinar format in 2014. Rick’s and Scott’s comments have been edited for clarity and length. 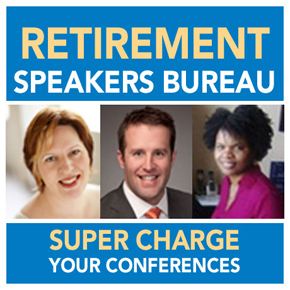 We’re going to talk about disability, financial and retirement planning considerations today. This is work that was developed in cooperation between NAPFA, the National Association of Personal Financial Advisors, and the Society of Actuaries. We want to also recognize Robert Beal of Milliman and the Life Foundation for allowing us to use their research on the real risk of disability in the United States. So today, we are going to characterize disability, sketch the dimensions of the threat to clients, identify how clients, your clients, can protect themselves, provide some guidance on evaluating insurance options, and time permitting, we’re going to look at some selected topics. And finally, we’re going to identify resources that you can look to for additional support. Clients and advisors do not fully appreciate the probability and financial impact of disability. The proportion of the working population that is covered by disability insurance is really quite low. In the nonworking population, it is not covered at all. So specifically, people who are working at home are not covered. Disability risk extends beyond income loss. It can increase medical costs and reduce access to medical insurance coverage, especially through the employer. Employer plans, while a good starting point, may not provide sufficient coverage. Indivudal disabilty coverage can fill gaps that are due to either insuffiient or unavailable employer plans. So what do we mean when we say disability? In particular, we’re interested in disabilities that influence the ability to carry out activities, to do jobs, to do work, and disabilities that have impact on eligibility for benefits. First, there is the pathology phase, which is sort of a medical perspective, which says this is a physical or mental condition that interrupts one or more physical or mental processes. From an impairment perspective, it’s a physiological, anatomical, or mental loss that limits a person’s capacity to function. Then there’s a functional limitation in performing or completing a fundamental activity. Finally, we have disability, and this is a limitation in performing socially expected roles and tasks, which may limit the ability to be employed, a work disability, or a work limitation. For example, if someone works at home, unless the person was forward thinking enough to have like a long term care policy of some sort, or some type of rider on life insurance, effectively the only outlet they may have is Medicaid for any type of coverage at all, assuming that they’ve never qualified or worked for pay where they contributed to the Social Security system. So based on that situation, there’s some potential that they would have absolutely have nothing. Or at the very best, they might have something from Social Security Disability Insurance (SSDI). So as you look at this, there’s just a wide spectrum. Obviously, people working for pay would have more options available to them either through an insurance company or an employer. As you go to the left to right, there are fewer and fewer options available really on the retired side. Again, you have to be forward thinking enough to actually have for example, long term care insurance, or again, some type of rider on a life insurance policy if you want something that’s non- government coverage. This just shows that interaction between SSDI, along with some of the either private or publically funded either group or individual policies. Normally, SSDI doesn’t interact with other policies that people can purchase. Even though you might have a program, certain benefits can actually get reduced because SSDI has been paying that individual. There really is lack of protection for those who don’t have insurance. Effectively, you’d eliminate that green bar, even if you’re working for pay but don’t have disability insurance. Anything that that green box would pay for is completely gone. You do not have another outlet to get any income whatsoever other than, perhaps, SSDI. The SSDI definition of disability, when it actually pays someone, is typically the most restrictive, which means it pays the least often of any of the programs. You can’t necessarily say what disability is when you’re talking about insurance because each company, each program, will have their own definition. Again, there really is not one definition in the insurance world of what disability means. This is just to say briefly because insurability is linked to work, people who work at home are much more difficult to cover. In general, people don’t tend to think about people who work at home as suffering from disability risk. But that’s an inaccurate assessment. I can speak from personal experience: When I was about 10 years old, my mother had a disabling stroke. She was completely disabled for a year and substantially disabled for 10 years after that at least. It was very expensive for my family to obtain help with care giving for the children at home and support for her. While I never spoke with my parents about it, I’m 100 percent confident that there was no disability insurance support for that situation. One of the issues in convincing people to buy disability insurance, is the assumption “that it’s not going to happen to me.” They look around maybe at their friends, family, and they don’t really see anybody they would consider disabled. Life insurance is a little bit different because either you know someone who has died or who is going to die. It’s a little bit easier to say yes to life insurance. 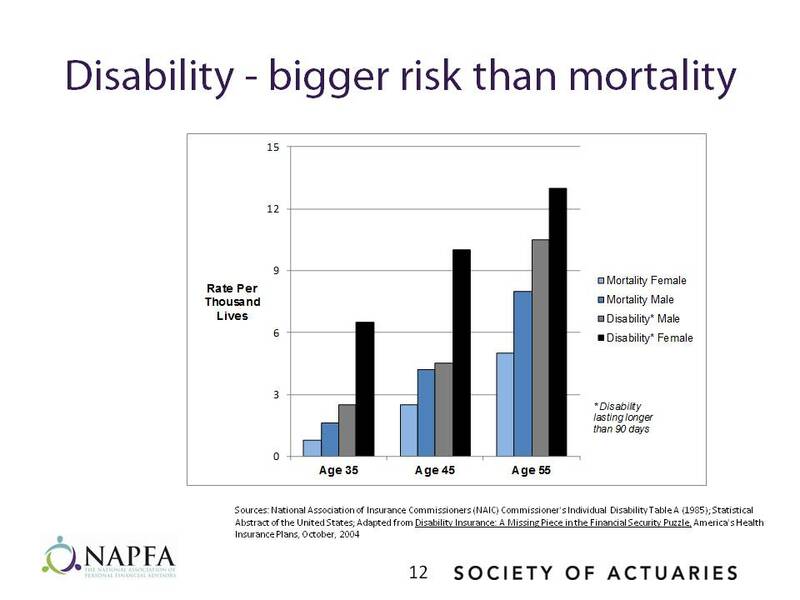 In terms of during the working life of both males and females, the chance that you become disabled is significantly higher than your chance of dying, which people typically don’t think about but that honestly is a reality. This chart shows the chance of a disability lasting longer than 90 days, as well as the mortality rates for that same age. For example, the light blue bar (the one on the far left) is the mortality females, compared to the one on the far right, which is the disability female. It’s about four to five times higher at the younger ages; you’re four or five times more likely to be disabled for 90 days than you are to die. This holds true as you age. You’re twice as likely to be disabled than you are to die. So in terms of the pure odds and pure chances of something happening, it’s a significant element of what could happen to you. 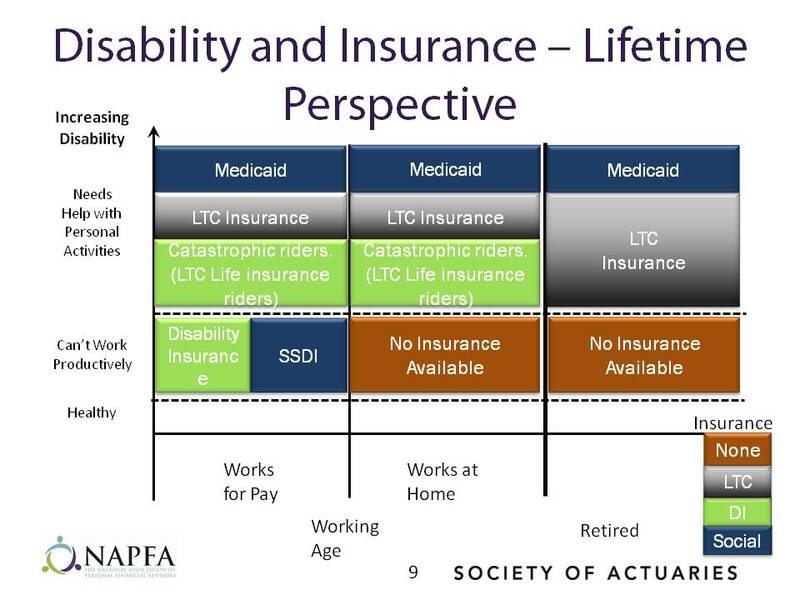 So depending on how you look at this disability in terms of a need, at least during working life, that’s something that you’re more inclined to actually be using than you are your life insurance policy. How Long Might a Disability Last? Once disabled, there’s a great chance you’re going to be there for a while. 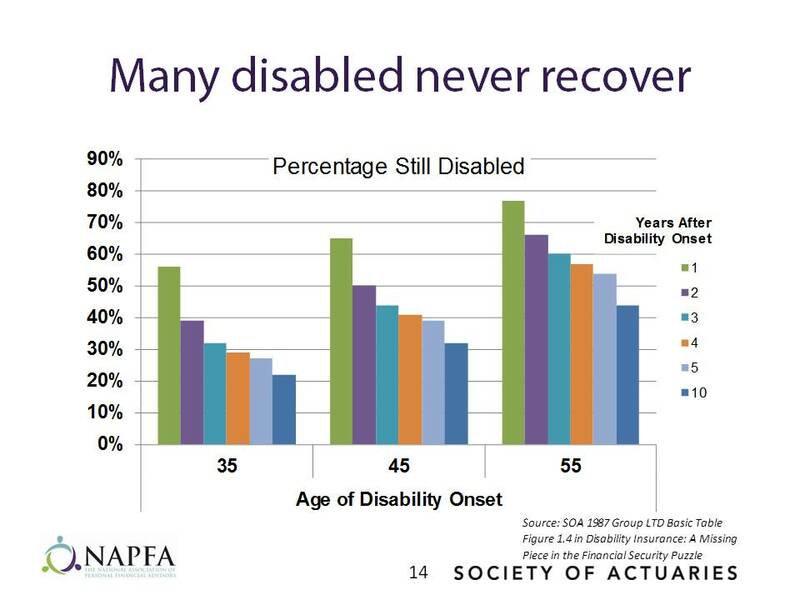 This chart looks at how many are still disabled at different points in time. On the far left for the 35 year old, there’s a little over 20 percent chance after 10 years that you’re still going to be disabled. As you get older, there’s a little under 45 percent chance that you’ll be there at least for 10 years; basically, until retirement. Half of your clients, if they became disabled at 55, are still going to be there at retirement age. That might be when they thought they were going to really start saving for retirement. I think a lot of people think about accidents, and they say, “Well, I’m a pretty careful person, so I don’t think I will become disabled. I’m a good driver, I have a nice, safe home; I just don’t think it’s going to happen.” Statistically, what this chart shows is only about 10 percent of the claims are actually caused by accident. 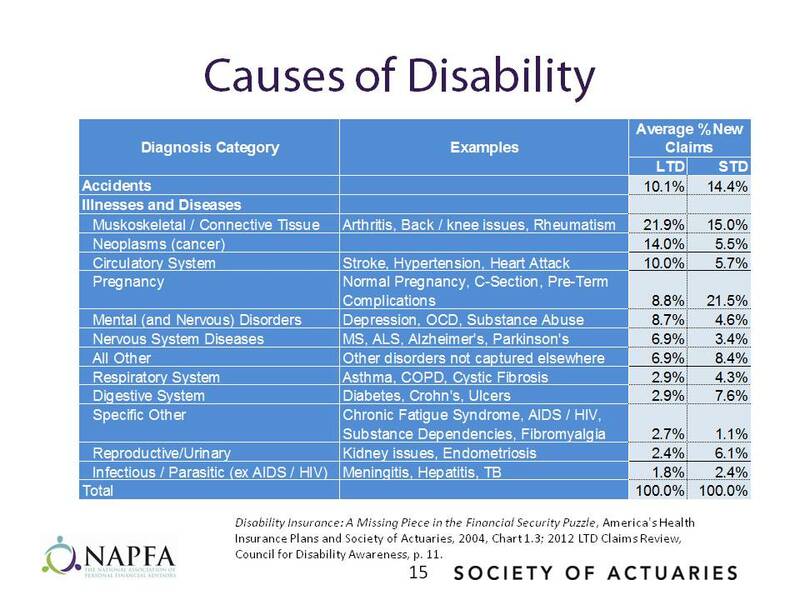 A very, very small percentage of disability is actually caused by accidents. The vast majority after that is caused by different illnesses, sicknesses such as muscular skeletal (back problems), knee problems, arthritis, rheumatoid arthritis; those types of things are about a fifth of all the claims. Cancer is another big one. There are a lot of items on here that people don’t really think about that it can cause disability. On this chart, you have long term disability, which is the left hand column, and short term disability, which is the right hand column. It is important to take a lifetime perspective on people’s wealth and disability. Until at least age 50, human capital is their largest asset. It is that asset that is threatened by disability. So a question is how do we translate disability into financial terms in financial losses? Here, we’re looking at age at disability and supposing that this disability lasts for the rest of life. Let’s say someone is age 35 and earns $75,000 a year (blue bar). If they were permanently disabled at age 35, the present value of the loss at 3 percent is about $1,500,000. At $150,000 in earnings, it’s almost $3 million. At $250,000 in earnings, it’s almost $5 million. These are very, very large losses. Even at age 55, the losses are still of the order of $750,000 for the person earning $75,000, and almost $2 million for the person earning $250,000. Losses of this size, suffered without any sort of insurance coverage, are enormously difficult for a family to overcome. In addition, if someone is disabled, even if they have insurance to replace their income, or at least some fraction of their income, they may not have insurance that will replace the retirement plan contributions that they were planning to make and that their employer might have been planning to make. Assume we have employee contributions of 15 percent of income and employer contribution of 5 percent of income. For the 35 year old, the losses are $750,000 to $2.25 million. For the 55 year old, we’re talking about losses that could be anywhere from say $150,000 to $500,000 or so. 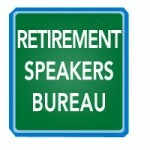 Standard disability income insurance does not replace retirement savings. Fewer and fewer employees are covered by defined benefit plans that integrate disability income and pensions, this lack of disability insurance is a very important gap. Detail really matters as you start talking about how disability defined. 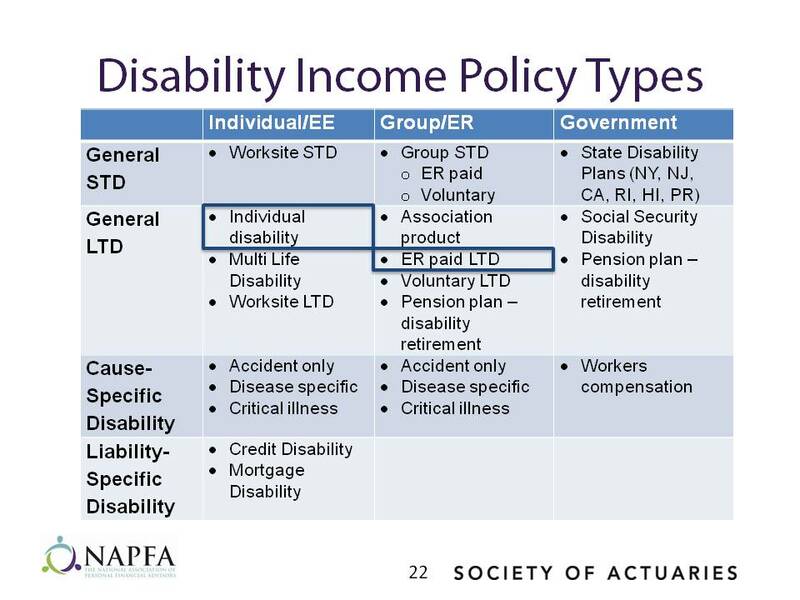 Based on the type of program – SSDI, group insurance plan, individual insurance plan – each will have its own variation on how it defines disability. Each word can have significant importance in terms of what types of disabilities are covered. A lot of the individual policies, if they provide the same benefits, will be approximately the same cost. So any time you start seeing huge cost variations of let’s say 20 to 30 percent, it probably does mean that there’s a big benefit difference; it could be in the definition of disability, it could be in another type of benefit that one policy is providing or doesn’t provide that the other one does. True own occupation is the most expensive. As you go to the far right, cost continues to decrease. So the Social Security definition is the cheapest from a financial perspective to insure according to that definition. “True Own Occupation” is defined as you’re not able to perform duties of your regular occupation, even if you are working in another occupation. An example of that would be someone who is a heart surgeon. Even if you could be a teacher at a college, but you are not able to be a heart surgeon, you would still be considered disabled. It’s most expensive because that pays more often than all the other definitions. “Modified Own Occupation” is similar if you can’t do your duties of your regular occupation, then you also can’t be working in another occupation. It means if you can’t be any type of surgeon, we might then consider you disabled. “Any Occupation” means you can’t do anything that’s similar based on education, years of experience, training, etc. It looks at your regular occupation, but can you do something similar where you can make the same wage in something else that you can do? Finally, the Social Security definition is more of a catastrophic definition, where basically your condition is going to end in death, or you’ll be expected to be disabled for at least 12 months. That one is the cheapest, if you want to call it that, and tends not to pay as often as any of the other ones. So again, depending on what the person is looking for, each one of these have cost implications. Key words can matter. For example, modified own occupation has an “and” in that second paragraph. Any occupation has an “or”. So it can be as simple as “does it say and or does it say or?” There are significant cost implications in that one word. So as you deal with disability contracts, if you’re promoting them to clients or other people, it definitely is something that has to be read carefully to really determine what it is actually paying for. STD is short term disability that normally pays up to 52 weeks. Long term disability is coverage for up to age 65 or retirement age. You have some cost-specific disabilities: accident-only, critical illness, which should cover heart attacks, cancers, strokes. Very specific types of things are covered. Workers’ compensation actually falls in that category too, because it would cover just “on the job” disabilities. Some liability-specific ones are less common, like credit disability and mortgage disability, which are for loans and mortgages, obviously. If disabled, it can pay off the balance or make the payments for you as you become disabled. Relatively few people have disability insurance beyond Social Security coverage (the most recent data we have is for 2011). At that time, there were 152 million people covered by Social Security disability, meaning that they’re paying into Social Security. Of that 152 million, about 32 million were covered by disability insurance carriers. So about one-fifth have group or individual coverage beyond Social Security disability coverage. Of those that are receiving benefits, only about 8 percent have individual or group coverage. About 30 million of the 32 million are group policies or employer policies; less than 2 million are individual policies. And we want to emphasize while everyone has the public coverage, in general, SSDI is not adequate for many people. It doesn’t cover all disabilities. It replaces only a small fraction of income for most. Workers’ comp covers very few disabilities, and very few states offer disability coverage. For those that do, the coverage is very limited. Group plans are less expensive because we’re typically insuring large groups of people. Benefits are going to be lower on the group plan because the premium is lower. You also typically won’t take that group plan with you when you move to a new employer. From an insurance company’s perspective, they’re not insuring you forever. They think if you’re going to be with an employer for five years, they’re really only insuring you for the chance you’ll get disabled in that five year window. The difference is, obviously, the individual plan goes with you. Group plans can be converted as you leave the employer. But those are typically very expensive, and if you were healthy, you’d find a much cheaper policy if you were underwritten for an individual policy. A key difference is that this approach has limited medical underwriting – usually a “yes” or “no” questionnaire. The individual plans, primarily because you can get higher benefits as well as they go with you as you change employers, also can have a significant importance in someone’s planning future. One additional point to highlight here is that in terms of the tax treatment of the benefits, with a group policy, typically, the employer is paying the premiums, therefore the benefits are taxable to the employee. With the individual coverage, the employee is usually paying the premiums, therefore the benefits are going to be tax free. Most of the plans in the group world are going to be “modified own occ”or “any occupation policies,” although some plans do exist that follow the Social Security definition effectively only paying if Social Security pays. Specified condition plans, even in the group world, also exist. It might be specified disease, accident only, the catastrophic ones, the activities of daily living if you’re unable to perform at least two of them… that’s the only way that the benefit kicks in. Short term disability that covers six to twelve months would be a typical short term disability policy. Long term disability policies will pay anywhere from probably two years all the way up to age 67 normally, or normal retirement age. A key element here, for a lot of the group plans anyway, is making sure that the short term disability and the long term disability policies don’t overlap because a long term disability policy will say if you’re getting money from the short term side, we’re not going to double pay you. We’re going to subtract off what you’re getting from short term from your long term disability benefit. There may be several different limits on the benefits. For example, regular pay, regular compensation, bonuses and commissions, and in some cases, K1 earnings is what the individual was earning before disability. After disability, depending upon the policy, the benefit may not relate to anything other than the regular monthly pay. The benefit is typically limited to 60 percent of the pre-disability earnings. In addition to that, the benefit may be capped at a maximum monthly benefit, such as $4,000 or $5,000 a month. Inflation protection: Fewer than 10 percent of the plans will have inflation protection added, even though it is available. You’d have to say you want this feature, otherwise, your benefits will stay fixed for the most part through your entire disability. Activities of daily living. If you’re unable to perform at least two, and two is kind of the trigger that most will use, you can get a higher benefit to help pay for some of the additional expenses, medical expenses, and so on because you have those conditions. Retirement savings riders can also be available, which will add on to the benefits you receive intended to be used for retirement. When people are disabled, there’s no longer a company match for their 401k. But there are riders that would help put aside some money into a similar type of vehicle that at least would set aside some money for retirement. Medical premium supplement. After about 6-24 months, you’re off of the employer paid medical plan and responsible for paying your own medical premiums. This is a rider that can be added on to a group policy that will pay something specifically for medical premiums. It would be pre-defined, so it might not exactly cover your new plan. But it would give you some income to help pay for the cost of that medical plan that you’re now responsible for. Change in employment. If you leave an employer, some group plans can be portable. Typically, the benefit you receive is going to go down, and your costs will go up tremendously. That’s just a reality of the group world, and that’s also why some of the individual plans can be important because those go with you as you leave an employer. Also, if you’re unemployed, some of the policies will allow it to stay in effect for brief time periods but not usually beyond three to six months. Again, that would come at cost for an employer. A lot of times they wouldn’t necessarily want to pay for that because you’re no longer working for them. Overhead expense, key employee coverages. These normally will actually benefit the employer and not the employee. So it would be in the employer’s best interest if they’re able to find these. This would help give the employer money so he can continue to operate. These would help them hire on a temporary basis somebody to fill in that need. Those are usually very short durations of six to twenty-four months but can be relatively high in terms of a monthly benefit such as $10,000 to $15,000 a month. So typically, companies will try to insure, at most, 80 percent of the after tax income that that person receives. As one works with or considers individual policies, one of the striking aspects of looking at those policies is, in addition to the complexity of the contract language, there are a lot of riders available. We have categorized the riders here as effecting the amount of benefit, the definition of disability, riders that are related to premium, and riders that effect the length of the benefit that would be received. If we’re thinking about disability insurance, we’re really trying, as with any insurance, to protect against a large loss because the small loss is one that, while it will have an effect let’s say in the year that it occurs, in terms of the lifetime impact it’s likely to be relatively small. But a very large loss, a long disability, is going to have a major impact. Inflation protection. Inflation protection will increase according to the Consumer Price Index or, in some cases, a fixed percentage. That benefit is most valuable in futures with high inflation. As an advisor, if you were thinking about an older client who was going to get an individual policy, the benefit might last only five years if the client is 60, or ten years if they’re 55. That rider is going to be potentially not quite as valuable, especially if you think inflation is likely to be low for the next five or ten years. Whereas with a 35 year old with potentially a 30 year benefit stream that rider is going to be potentially substantially more valuable. Future increase protection allows the coverage to increase as earnings do without having to go through medical underwriting again; it protects you against a health decline. If we’re talking about a 35 year old, and they get a significant raise as they turn 40, without the rider the benefit will not increase and therefore, they might have to reapply for insurance. If their health has declined, they may not be able to get the same coverage. 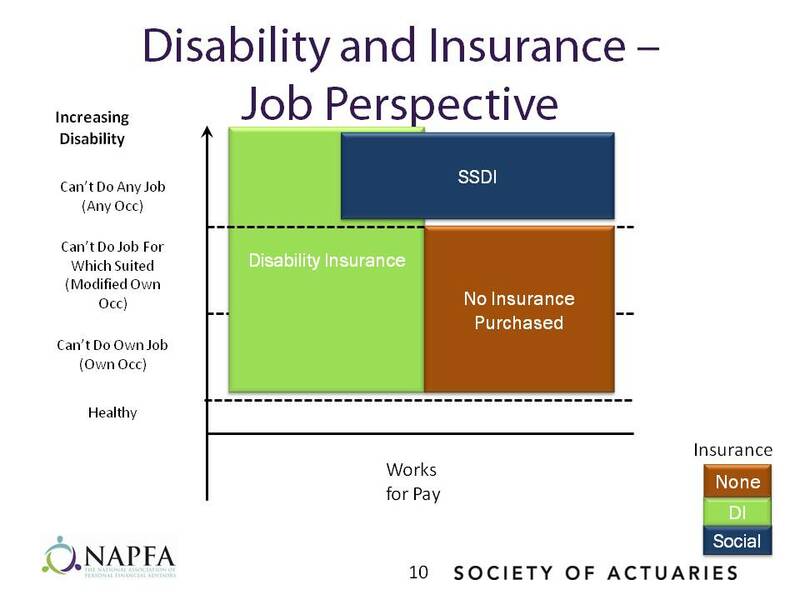 Social insurance supplement pays an additional benefit if the insured doesn’t receive the SSDI benefits because their disability doesn’t satisfy SSA’s definition. The white collar individual is fairly likely to not qualify for Social Security disability. You could possibly short change your client if they don’t have this rider because the insurance company will assume that they’ll get something from Social Security, even though maybe they don’t. Business owner rider that covers extra expenses incurred by a disabled business owner. If your client is a business owner, this can be very valuable and very important. It’s also frequently available as a standalone policy. You want to compare the costs and the benefit of a rider like this with a straight overhead expense policy. The retirement protection rider is one that will fund typically a trust that will make contributions to that trust in lieu of the contributions that the employee and the employer would have made to let’s say a 401(k) or a 403(b). The benefits are paid into an irrevocable trust. The proceeds are distributed at 65. This protects significantly against not having enough money in retirement. Because it’s not disability income, it does not affect the fraction of income that the carrier will cover. So as an advisor, I think this is a very important rider. In some cases, this is also available as a standalone policy. Partial disability states there is a certain time period, which might be one to three months, that you actually have to be totally disabled, which means not working at all. After that, you can return to part time employment and still possibly qualify for disability benefit. For example, if you’re unable to work for three months, you return twenty hours a week. Partial disability would say that’s okay. Residual disability is a little bit different because it never requires total disability. If you’re only able to work 10 to 20 hours a week, it would still say “okay” after you’ve hit the end of your elimination period, you will get a partial amount of your benefit. The biggest difference is that partial disability typically will have a total disability requirement, which means no work whatsoever followed by part time. Most of the residual contracts would say you could be working part time throughout. Partial disability sometimes actually is residual disability. You need to read the terms of the contract to actually figure out if there a total period required. It should mention you need to be totally disabled and really using those terms. You have to be totally disabled before this partial disability rider would kick in. Back at the very beginning of the presentation, we talked about degrees of disability ranging from not able to work to actually needing help with daily living activities. 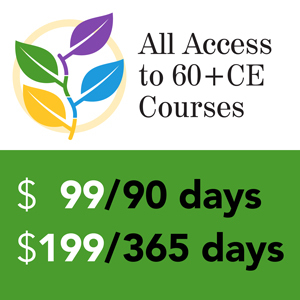 Catastrophic disability provides an additional benefit if the person who is disabled, in effect, meets the long term care definition of needing long term care. Catastrophic disability benefit is valuable because it covers up to age 65 if catastrophic disability occurs. Spousal catastrophic disability coverage is the only coverage for a spouse working at home that is available in the event of disability to the spouse working at home. With a non-cancellable rider, the premium is locked from issue if premiums are paid timely. When you’re thinking about these riders, it’s important to consider them in combination with any long term care coverage that the client may already have. As an advisor, I tend to think of these as less valuable than the disability income coverage. If we’re dealing with a client who is very cost conscious, I’d far rather have them have a disability policy without these riders than no disability policy at all. 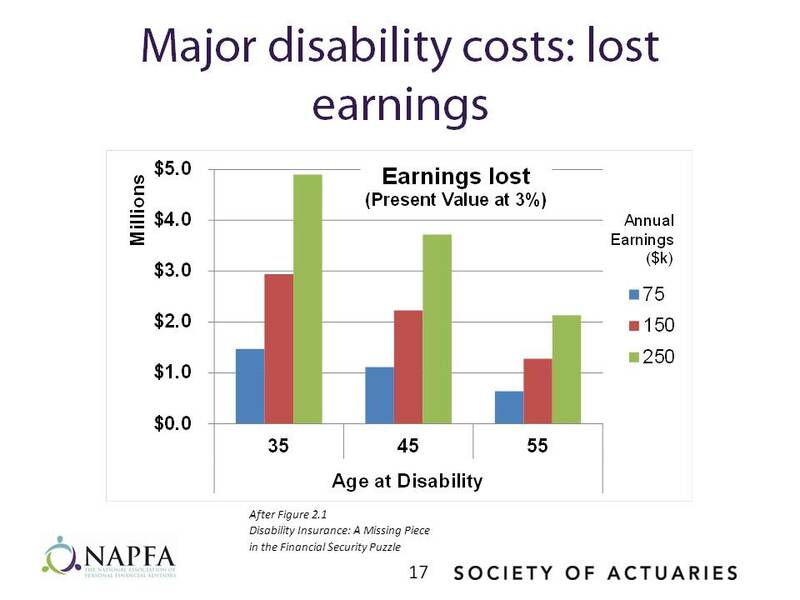 Disability is a major cause of early retirement. The impact of disability on retirement and income in retirement is much greater now that we’re in a defined contribution (DC) world rather than in a defined benefit world, because DC retirement plans do not integrate disability with retirement. So that emphasizes the importance of the retirement income riders that we talked about or the retirement income plans that we talked about earlier. Disability is a big threat to retirement because people who are disabled and who do not have adequate insurance frequently will go to their retirement accounts for funds to support their living if they’re disabled and can’t work. In addition, even if they do have disability income insurance, they may not be making contributions to retirement plans if they are disabled, and they don’t have the retirement income rider or a special retirement income insurance plan. Standard disability income insurance has benefits that stop at 65. And many of our clients plan to work longer than 65. So that’s a real issue if you’re working with clients and planning to have them work past 65. If workers are planning to cut back on the amount of time that they’re spending at work, let’s say starting at 62 or 64, they may not have disability coverage when they start to do that. If their plan calls for them to work part time let’s say through age 70, they may not have disability coverage at all. In terms of thinking about the risk to retirement, the best way to protect against the retirement risk is to be sure that you have enough disability income and the retirement protection rider or a special policy for that. So how can you tell, as an advisor, if your client has good disability income coverage? The first criterion to look at is you want high replacement of after tax income for the working life. So you’ve got to look at benefit amount. 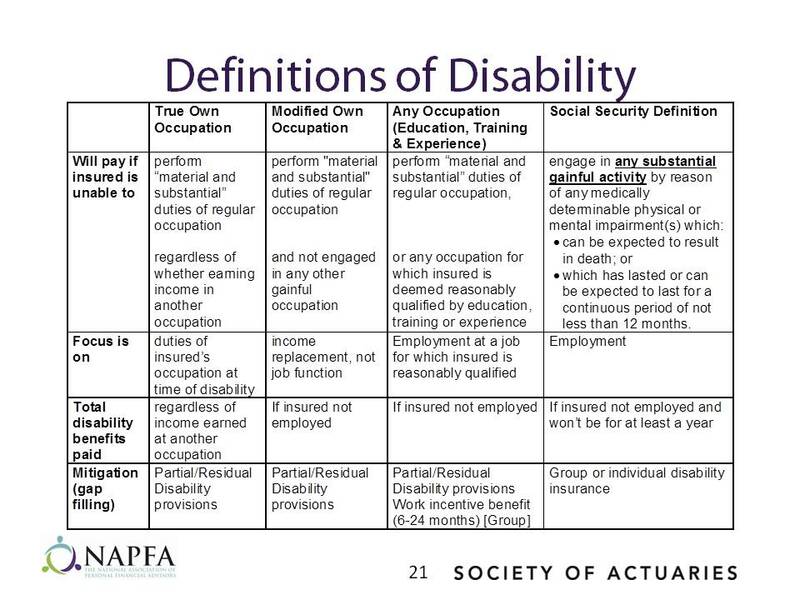 Look for a strong disability definition because the weaker the disability definition is, the less likely it is that for a given degree of impairment that there will be full replacement of income. Assume an individual has pre-disability income of $150,000, income tax straight off the table of $29,500, after-tax income of $120,000, and after-tax income as a percentage of pre-disability after tax income is 100 percent. Now, suppose that they have group coverage with a 60 percent replacement percentage and a maximum monthly benefit of $4,000. So 60 percent of $150,000 is $90,000. However, they’ve got a maximum monthly benefit of only $4,000. The employee didn’t pay for it, so there’s going to be tax. Their after tax income is going to be $41,000. Even though the policy says there’s a 60 percent replacement in practice after-tax, they’re only going to have 35 percent. This would be a prime candidate for looking at a supplemental individual policy. Suppose that they could get an individual policy that would pay them $5,000 a month, or an annual benefit of $60,000. The employee is going to pay the premium. So there’s not going to be any income tax. The after-tax disability income is going to $60,000. That’s going to cover 50 percent of the after-tax income. So together, they’re going to have $108,000. They’re going to pay $6,000 in tax. The after-tax income is going to be $101,000. They’re going to get $84,000. Individual carriers are not going to be thrilled about a benefit that’s going to take them over 80 percent, so this may be a little bit high in terms of what they might be able to get. But it does illustrate the point that it’s important to think through the benefits that will be available under the group coverage and that an individual policy can be very valuable in terms of helping protect your clients. 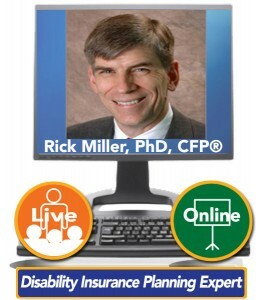 We hope that you’ve recognized disability income insurance is very complex. It is very helpful to have a knowledgeable professional that you can rely on to advise you. Either a broker or a fee only insurance advisor can help you sort through the various implications of the existing group coverage (if there is group coverage), and then the way that a supplemental individual policy might be valuable in helping provide well rounded coverage. Then look at the group policy to see how income replacement occurs, how much income replacement occurs, what the definition of disability is, is there supplemental coverage available that you can take advantage of, and potentially take advantage of the ability of the employee to pay the premium for the group coverage. We’ve come across a few cases where the group will allow the employee to pay the premium. Then the benefits will be tax free. If the group policy is not sufficient, seek individual coverage, identify riders that could be important, and business owners may need additional coverage, for example, overhead. The Disability Can Happen website, which is sponsored by the Council for Disability Awareness, has a lot of very good general topics that are available, as well as different brochures, different statistics that people really are convinced by, life stories, testimonials, and so on about disability coverage. The Council for Disability Awareness is sponsored by around 20 insurance companies, so it’s not a single carrier’s perspective. Rick Miller has worked in financial services for over twenty years, first as a management consultant, then in product and business development at Scudder Investments, and now at Sensible Financial, which he founded in 2002. Financial Advisor magazine ranked Sensible Financial as one of the fastest growing registered investment advisory (RIA) firms in both 2005 and 2006. Assets under management are now approximately $300 million. 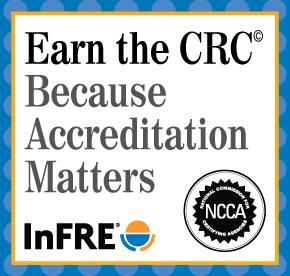 He is a CFP® Certificant, and a member of both NAPFA (the National Association of Personal Financial Advisors) and the Financial Planning Association. He is a strong advocate for the Life Cycle Planning and Investing approaches within the profession, and frequently conducts professional seminars on those subjects. 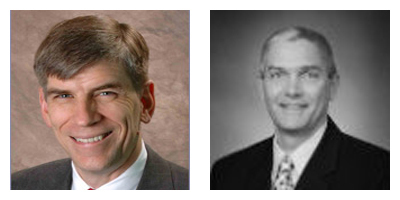 He recently served on both the Trends in Financial Planning and Job Analysis Task Forces of the CFPÒ Board. He has been quoted in the Boston Globe, businessweek.com, NPR’s Nightly Business Report, and other local and national media. He holds AB, AM and Ph.D. degrees in Economics from the University of Chicago. Scott D. Haglund, FSA, MAAA, FLMIhas over 25 years of experience in the insurance industry in a variety of roles and products. His perspective on the insurance industry has been formed by being involved with several companies and roles, working directly with stock, mutual and fraternal insurance organizations both as an employee and as a consultant. This variety of experiences has helped him gain a global perspective of the opportunities that are present due to the risks involved with insurance products. Throughout his career, he has been actively involved with both group and individual products. His primary areas of expertise are group disability (long and short-term), group life, administrative services only plans (life and disability focused), individual disability, individual life and individual annuities. Within those products, he has performed pricing, rate and form filings, modeling, product development, reserve adequacy, valuation, experience analysis, reinsurance analysis and negotiation and compliance. He has had the opportunity for both customer and broker presentations, and regular interaction with marketers of the products (career agents, independent agents, brokers). Other areas that he has worked with significantly are underwriting, claims, marketing, accounting, finance and IS.